Blurb- ‘A Knotty Affair’ is a story about a thirty-year-old software engineer, Viraj Sargaokar. Born into a middle-class family that lives in the suburbs, he joins a south Bombay college, where he encounters a culture divide between him and his rich classmates. Viraj is fascinated by a classmate Ruhi, a beautiful good-natured girl, who befriends him and treats him well, unlike the rest of his classmates. Will Viraj be able to prove his father’s innocence? Will Viraj survive the rigours of college life and overcome his shortcomings? What will happen to the relationship between Ruhi and Viraj? Review- A Knotty Affair is simple fast flowing novel by Dhaval Birajdar Jinadatt which tells us about some important yet interesting life events of Viraj Sargaonkar. The book focuses on how Viraj defeats the odds and succeeds. I received free copy of this book from Cyclopes Literary Services in exchange for an honest and unbiased review. Book Cover and Title- Book Cover is appealing and confusing at the same time which makes positive impact on readers mind. However it could be improved. Book title is attractive. Blurb is short and clears all the confusion about the story. Language and Narration- Language of the book is simple and easy to comprehend. Narration is done in first person and is done well. However too many editing errors makes reading experience slightly difficult. Characterization- Characterization is where author wins my heart. The way little details about characters are mentioned and how characters evolve with the story is amazing. Storyline and Plot- Storyline is straightforward with few twists and turns through the book. Book is divided into 7 defences. Each defence has twists which holds readers with the book. Although the story is straightforward it has many loopholes. Sometimes the story seems annoying even though characters are portrayed beautifully. Also storyline and plot is usual one and has nothing to give except beautiful characters. 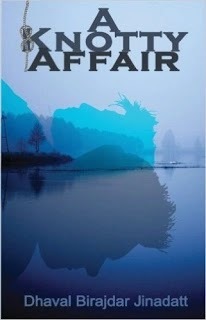 Overall, A Knotty Affair is inspiring yet interesting novel which serves us beautiful characters with usual storyline.